The big chill in Ridgewood. Photo by Robert Malmberg / Nowadays. Fathom editorial director Jeralyn Gerba reports on her new stomping grounds on the Brooklyn/Queens border. RIDGEWOOD, QUEENS – To the stay-on-the-grid Manhattanite or stick-to-my-subway-line Brooklyn resident, riding the L train out a dozen or so stops to Ridgewood, Queens, can feel like the schlep of a lifetime. But as New York City's population soars — according to the most recent census, we're already on track to beat the 2020 projection — more and more people are seeking out farther-reaching pockets of Brooklyn and Queens to do what New Yorkers do best: pioneer, build community, take on creative enterprises, do weird stuff. Some of those pioneering, enterprising people doing weird stuff include my husband and his friends. 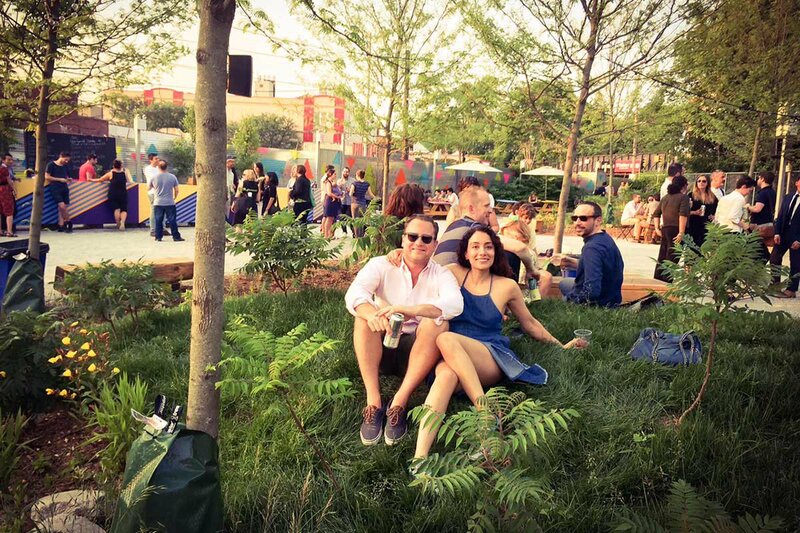 This summer, they turned what was more or less a gigantic old junk yard on Cooper Avenue into a sprawling backyard hang with neon-painted trees, grassy hills, picnic tables, a bar, and a grill. They call the place Nowadays, and the grand scheme of the seasonal outdoor spot is to create a place where you can take your dog, your kids, or your whole birthday party for a laid-back evening of sangria, grass-fed burgers, ping pong, and lightning bugs. Many of the patrons I chat with — artists and teachers and firefighters and guys loosening their ties — are locals who know about the cool things tucked into and around the manufacturing and residential zones. Ridgewood isn't an in-your-face hot-bed of coolness. You've got to creep up on the cool things hidden out of sight and off the beaten path. And that's what makes it great. Get it while it's hot. Photos courtesy of Houdini Kitchen Laboratory. 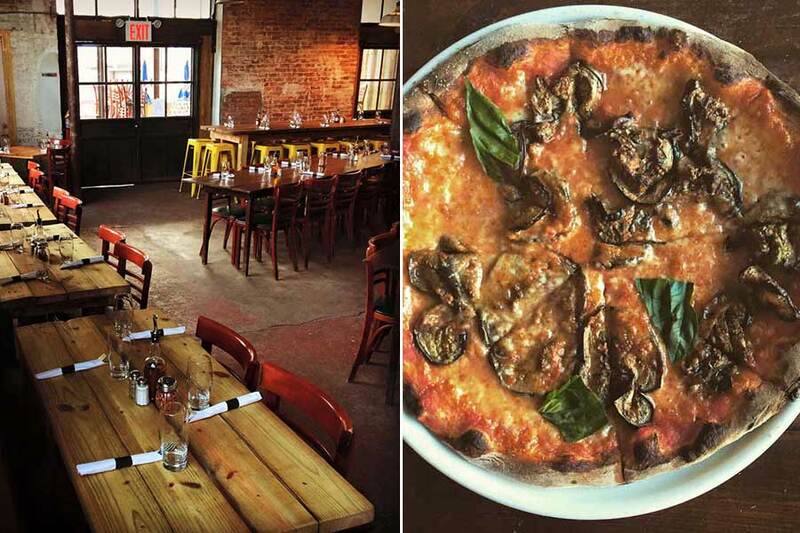 For example, after snacking on gigantic pickles and drinking beer at my husband's venue, we sometimes get a craving for a pizza from Houdini Kitchen Laboratory, an industrial warehouse space retrofitted with a vintage fridge, handmade wooden tables, and a big wood-fired oven. You have to enter through the loading dock that has been turned into an outdoor seating area. The salads are generous; the wine is affordable; and the thin-crust pizzas strewn with stracciatella, rapini, prosciutto, and wine-cured sausage are excellent. The name, a nod to the legendary escape artist buried in the nearby cemetery, does seem to be imbued with a little magic. It's fundamental. Photos courtesy of Topos Bookstore Cafe. Intrepid, party-going New Yorkers have been following Todd P for years; he's the guy who brought indie/jazz/ambient/avant-garde bands and producers under dilapidated warehouse roofs in Williamsburg in the early aughts. He also ran the graffitied, off-beat, alternative music venues 285 Kent and Market Hotel. The dude is always well ahead of the curve, and it comes as no surprise that he's already embedded in Ridgewood with Trans-Pecos, a venue for diverse sounds, comprehensive live music shows, community programming, and affordable yoga. Beyond the manufacturing zone north of Myrtle Avenue, there's a strech of quirky, commerical happenings. Topos Bookstore Cafe springs from the kind of makeshiftery that makes me hopeful about the future of NYC. 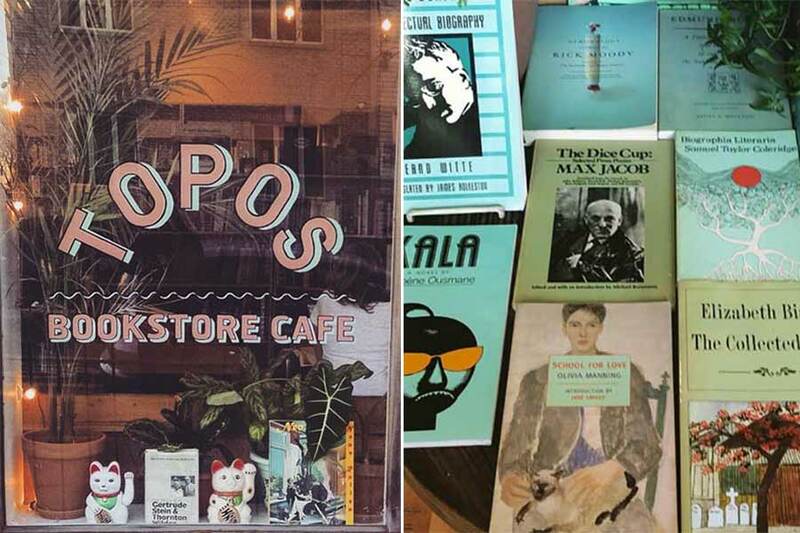 There's an eclectic range of used and new books, a schedule of readings and film screenings, a little cafe, and a no WiFi policy (so that you actually read or interact with live people). Morning vibes. Photos courtesy of Milk & Pull. The sign of the beginning (or end?!) of a neighborhood: high-quality coffee. Around here, it can be procured at Milk & Pull, where the buzz trifecta (Stumptown roasts, Dough doughnuts, bagel sandwiches) will make your morning commute go by lickety-split. Every neighborhood needs its requisite wine bar, and Julia's — which serves appropriately date-nightish bites (goat cheese and honey crostini, charcuterie boards, chocolate waffles) — fills the cozy gap with storytelling evenings ("Bar Time Stories”) and rustic brunches and $5 mimosas. The folks who run this spot also run the wildly popular Norma's Corner Shoppe, a cafe and scratch bakery that has managed to attract a perfect cross section of the community, from the old Italian lady coffee clutch to slacker students skipping class. The butcher shop scene. 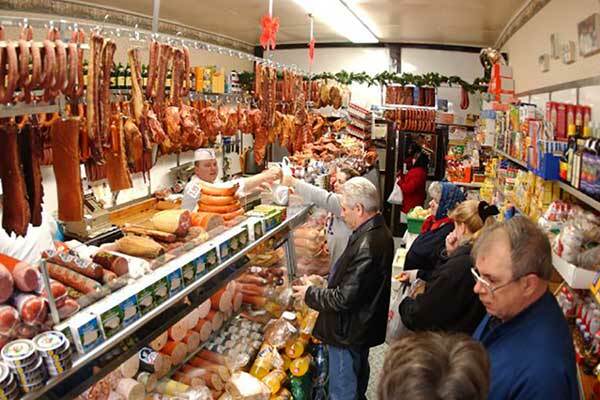 Photo courtesy of Morscher's Pork Store. The diversity of the working class neighborhood is one of its biggest charms. There are lots of Polish delicatessens, German butcher shops, Dominican restaurants, and entirely unpretentious and solid watering holes. It could take months (years!) to explore them all, but some shout-outs are in order: Morscher's Pork Store (immaculate presentation, nice staff, excellent prices), Catania Bakery on Fresh Pond Road (Italian pastries, particularly sfogliatelle), Super Pollo (beloved Mexican-style rotisserie chicken), and Ltauha Restaurant — a bare bones American bistro run by a bunch of guys from the kitchens of Dumont, Dressler, and Diner (yes to perfectly cooked burgers and fries). There's a long and tenuous history between artists and real estate in the city, and many are living, working, and showcasing in the neighborhood. I haven't done a thorough gallery hop just yet, but a few spaces look interesting: Lorimoto for group shows; 99¢ Plus Gallery on the outskirts for the outliers; Armature Art Space and Reservoir for the DIY appeal. 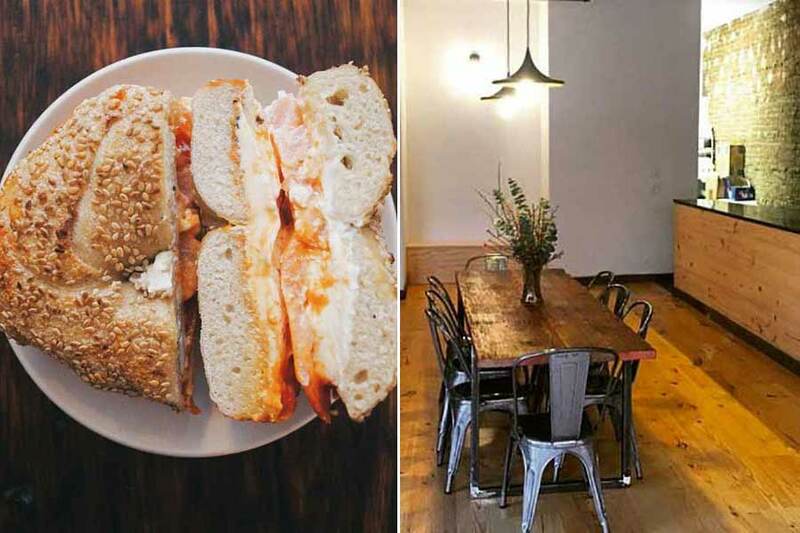 Take the L train to the Dekalb or Halsey Street stop on the border of Bushwick and Ridgewood. Or take the M train to the Myrtle-Wyckoff or Forest Avenue stops.